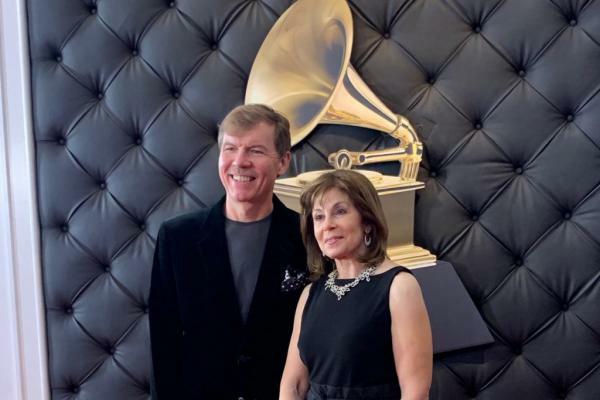 Composer Kenneth Fuchs, a UConn professor of music, left, and conductor Jo Ann Falletta, after winning a Grammy for Best Classical Compendium. Trumpet player Louis Hanzik, a professor at UConn, played horn on the album "Emanon," from the Wayne Shorter Quartet. It won the 2019 Grammy for Best Jazz Instrumental Album. UConn was a double winner at the Grammys on Sunday, in classical music and jazz. The work of Kenneth Fuchs, a professor of music composition at UConn, has been nominated in the past, but this time he won. Fuchs's collection of pieces performed by the London Symphony Orchestra took home the prize for Best Classical Compendium. Fuchs was up against some big names at the 61st Grammy Awards, including John Williams, best known for his "Star Wars" and "E.T." compositions. Last year, Fuchs told NEPR's John Nowacki that while he's in his element now, at the beginning of his career, his pieces seemed counter to a trend of more dissonant compositions. “In the face of [composers] Babbitt and Carter and Sessions especially, to come in [to Julliard] with music that was distinctly tonal — it was quite a journey for me to compose in the voice that I compose in now," Fuchs said. UConn can also boast about its connections to a second 2019 Grammy. Music professor Louis Hanzlik plays trumpet on "Emanon" from the Wayne Shorter Quartet. The album won for Best Jazz Instrumental Album. Copyright 2019 New England Public Radio. To see more, visit New England Public Radio.